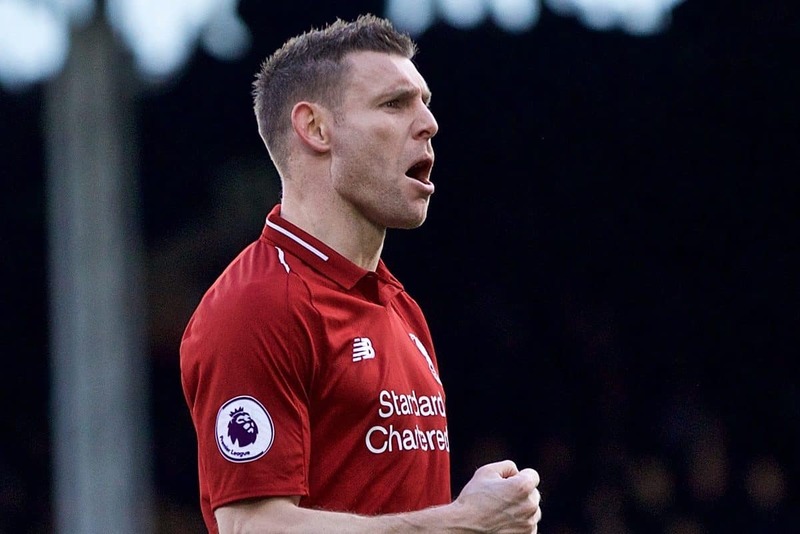 Liverpool snatched a crucial 2-1 victory at Craven Cottage courtesy of James Milner‘s late penalty after Ryan Babel’s bizarre equaliser for Fulham. Mostly a spectator throughout the game—a couple of relatively routine saves aside—Alisson was involved in the calamitous mix-up with Virgil Van Dijk as the ball squirmed under his body for Ryan Babel to tap into an empty net. It was an extremely rare moment of miscommunication with his back line which could easily have proved very costly. Scorched for pace at one point in the first half by Babel and his delivery was mixed throughout. Produced several excellent balls into the box, but also plenty of promising situations were wasted by either heavily over-hitting his crosses or failing to clear the first man. 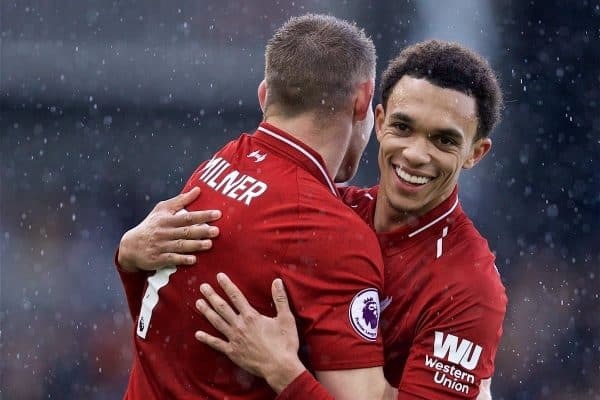 Even on a slightly off-day, Alexander-Arnold remains one of Liverpool’s most creative players and was always involved in trying to make things happen in the final third, despite the inconsistent execution. Generally a rather quiet afternoon for Matip, as it was his central defensive partner who was at the scene of the crime for Fulham’s equalising goal. Used the ball sensibly and did the basics well enough defensively when called upon. Strolled through the contest with his usual supreme authority up until the disastrous moment when he didn’t get enough power on his header back to Alisson, as Babel capitalised on the error to equalise for the hosts. 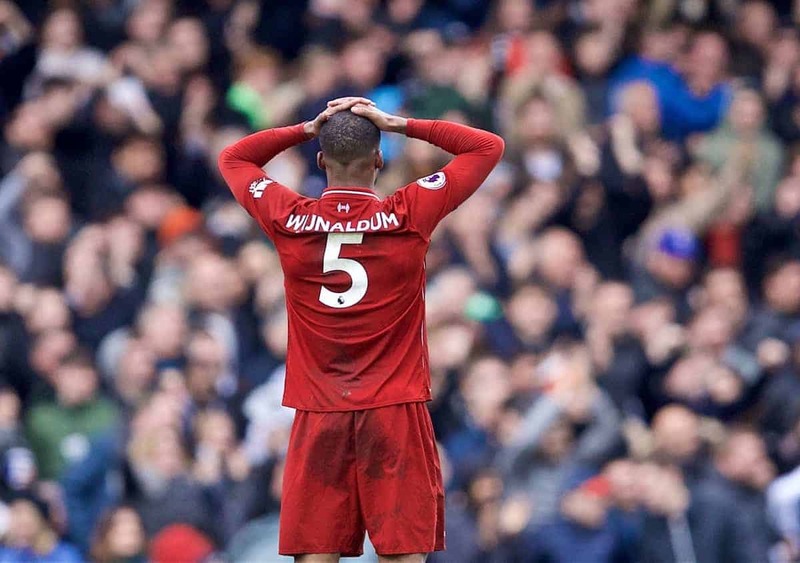 After bailing his teammates out of numerous difficult situations throughout the season, he will have been mightily relieved that this bizarre lapse in concentration didn’t end up costing Liverpool a vital two points. Linked well with Sadio Mane in the final third and constantly joined the attack, but his final ball wasn’t quite up to scratch for the most part, and he opted to shoot from a tight angle when better options were available in the first half. He did supply a superb ball in the second half, which Gini Wijnaldum should have done better with, and covered an enormous amount of ground marauding up and down the wing. Picked up a booking for a clumsy challenge in the first half and risked getting sent off with another late tackle which went unpunished just a few minutes later. 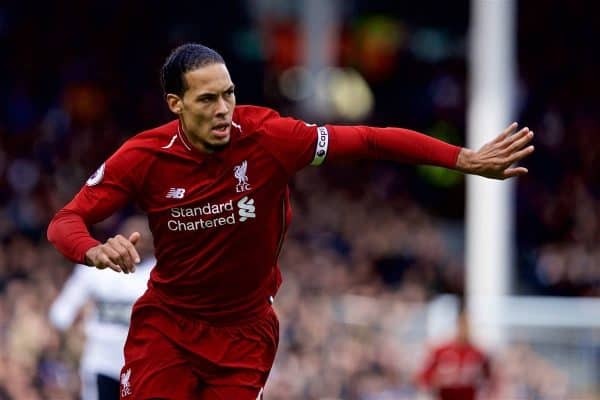 Kept his discipline superbly to stay out of trouble thereafter, and played several pin-point raking passes out wide to Alexander-Arnold in space in the second-half. After a fairly subdued first half, Wijnaldum played a much more active role in an attacking sense after the break and got himself into the penalty area on numerous occasions. Could have done better with a header from Robertson’s cross, and was unfortunate not to win a penalty when Timothy Fosu-Mensah climbed on his shoulders and prevented him from reaching a ball into the box. Harried well and was highly effective in regaining possession by tracking back and nicking the ball to get Liverpool back on the front foot again. Took up clever positions in between midfield and attack, and showed quick feet with a smart dribble in the box in the second half before being substituted for Milner with 20 minutes left to play. Another respectable display and more evidence that Lallana can still be a useful figure during the run-in. Heavily involved in much of Liverpool’s attacking play, but Salah’s frustration about his lack of goals recently is evident to see, as he looks to be over-thinking every decision rather than playing on instinct. 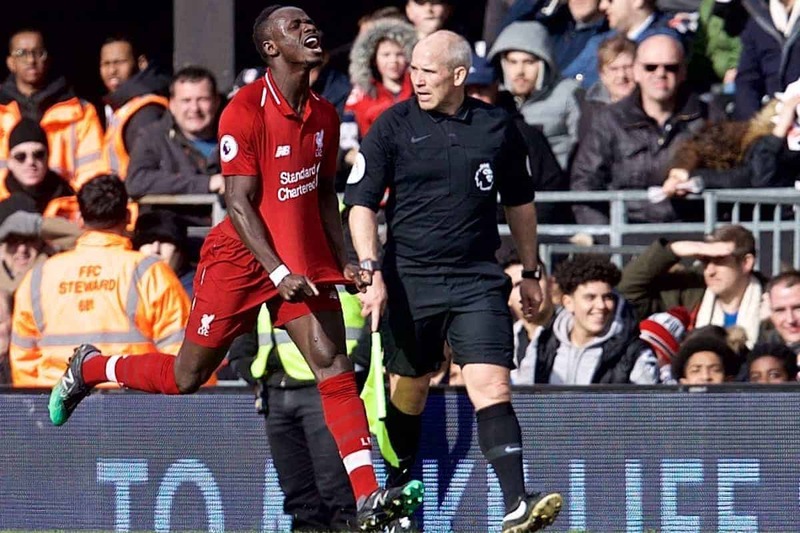 His curling shot did lead to the situation whereby Sergio Rico brought down Mane for the penalty, but Salah later spurned a golden opportunity to put the game to bed as he hit his shot tamely at Rico after being played in on goal by Mane. It will come, but he needs to relax and back himself more. Still a threat even when playing nowhere near his best level. Provided the assist for the opening goal, making a clever run in behind Fulham’s backline and having the awareness to pull the ball back into Mane’s path. That moment aside, he was guilty, along with several of his colleagues, of being complacent in possession, making sloppy passes and rushing the final pass which ultimately killed countless promising attacks, which led to the frantic situation of chasing a winner in the closing stages. Substituted for Divock Origi for the final 20 minutes. Continued his fine form by opening the scoring after 26 minutes with a move he started himself, exchanging passes with Firmino before finishing coolly from close range for his 20th goal of the season—matching last season’s total. Almost added a second with a glancing header from a corner in the second half which hit the bar, and was alert to steal in and give Rico a decision to make as he won the penalty which secured Liverpool all three points. Yet another decisive contribution which could well turn out to be a pivotal moment in the season. 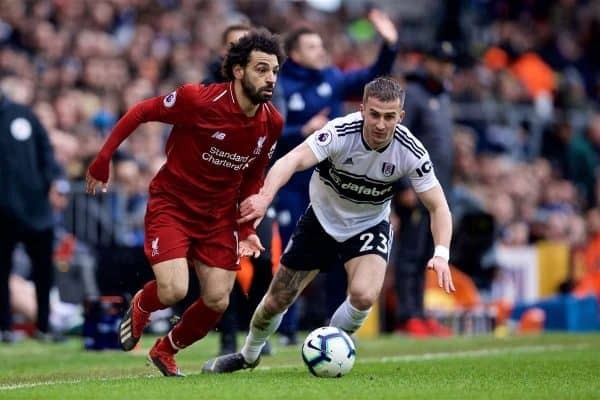 Awful sliced ball created the scenario which led to Fulham’s equaliser, but had nerves of steel to bury the crucial penalty and ensure Liverpool picked up an essential victory where anything else would have been disastrous. Made himself available for the ball at all times and offered a direct threat with several enterprising runs down the left. Barely featured in the final few seconds as Liverpool ran the clock down in stoppage time. It’s always a difficult task preparing for a weekend league fixture after such a demanding midweek Champions League game, in which Liverpool expended a great deal of physical and mental energy in dispatching Bayern Munich so impressively at the Allianz. He was visibly frustrated, though, with the lackadaisical manner of much of Liverpool’s first-half play, despite the scoreline going into the break. Acting at the right time with his substitutes, Klopp couldn’t possibly have foreseen the error between Alisson and Van Dijk which led to the equaliser, but his decision to bring Milner on shortly beforehand proved significant as he calmly converted the penalty to secure the three points. 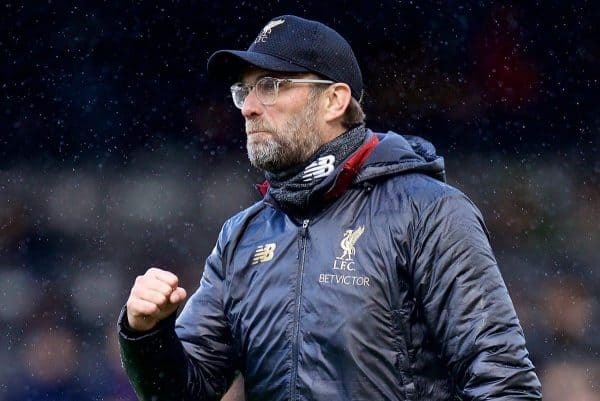 The nature of the performance will not have pleased the manager, but he will have been hugely satisfied to get out of there with the win, as Liverpool go top of the league heading into the international break with time to take stock ahead of the final run-in.